***COMPLETELY SOLD OUT!! THANK YOU!! . DIY Booklet Wedding Invitation made from metallic gold handmade cotton rag paper. Textured and incandescent. Booklet is diecut and scored, with a handsome pocket for rsvp set or enclosures. Bound with gold chiffon ribbon. Booklet style invitation sheet - perfect for 2 language wedding invitations. Modern landscape design and rich colors belies that this is one of our budget designs. Mails completely flat in an A7 size envelope. Beautiful handmade paper. This is an eco friendly design. The paper is treefree but the booklet is coated with a metallic finish. You print on 100% cotton paper. (tree free). 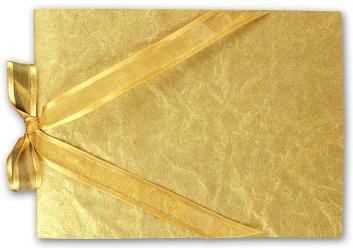 Tie:Half yard of gold chiffon ribbon ribbed with gold satin.